Kenny Karst / DNC Parks & Resorts at Yosemite, Inc. Since you’re visiting the park for the scenery, why spend the night walled off from it? Try one of these eight recommended Yosemite campgrounds graced by the Sierra Nevada’s starry skies and sweet mountain air. BEST SITE: White Wolf. Nestled in a lodgepole pine forest at 8,000 feet, the campground provides a taste of the Yosemite high country without the drudgery of backpacking. The camping gods are smiling on you if you score site 28 (our favorite), 22, or 23- the largest and most private options. White Wolf offers a few luxuries, including delicious meals at neighboring White Wolf Lodge ($$; breakfast, box lunches, and dinner daily, reservations required; 209/ 372-8416). Trails to Lukens and Harden Lakes lead from the camp. 74 sites Jul-early Sep; $14. 209/372-0200. Porcupine Flat. Situated 38 miles from Yosemite Valley, it’s often the last to fill up on summer nights, and it’s ideal for exploring the high country. 52 sites Jul-early Oct; $10. No running water. 209/372-0200. Big Bend. Set in a quaking aspen and Jeffrey pine forest alongside Lee Vining Creek, Big Bend is a perennial favorite of Yosemite veterans. It’s just 9 miles from the park’s eastern boundary. 17 sites late Apr-Oct 31; $17. Inyo National Forest, or 760/647- 3044. Ellery Lake. The granite-backed lake surrounded by jagged peaks lies 3 miles west of Yosemite’s eastern border at an elevation of 9,500 feet. The best sites are set off from the main camp by a short walk. 21 sites May-Sep; $17. Inyo National Forest, or 760/647- 3044. Saddlebag Lake. At 10,087 feet, the location’s a major entrance point for the 20 Lakes Basin, a favorite hiking and angling area. And it’s only 5 miles outside Yosemite’s eastern boundary. Sites 16 and 18 have a lake view to die for. 20 sites Jun-mid-Oct; $17. Inyo National Forest, or 760/647- 3044. Sawmill. Each campsite has a drop-dead gorgeous view of the High Sierra- mountain peaks, a subalpine meadow bisected by a rushing stream, and scattered whitebark pines. If there’s camping in heaven, this is what it looks like. 12 sites May-Sep; $12. No RVs; no running water. Inyo National Forest, or 760/647- 3044. Summerdale. Located 1 1/2 miles from Yosemite’s southern entrance, Summerdale is set at 5,000 feet in elevation on Big Creek. Many campers spend summer afternoons cooling off in the creek’s deep, clear swimming holes. 29 reservable sites Jun-Nov; $17. or 877/ 444-6777. Show up right around checkout (10 a.m. in Yosemite Valley; noon at all other park camps) to get your pick of available sites as campers vacate. Be bear aware. Don’t leave food or any other scented items (cosmetics, toilet- ries) in your car or tent―store them in your campsite’s bear box. Outside the valley, be as self-sufficient as possible―it’s a haul to the nearest store. Think outside the valley. Rather than vying for a spot in the crowded valley, try one of the campgrounds along Tioga Road. To snag a summer spot, log on to recreation.gov at 7 a.m. on the 15th of the month, five months in advance of your visit, and start clicking. 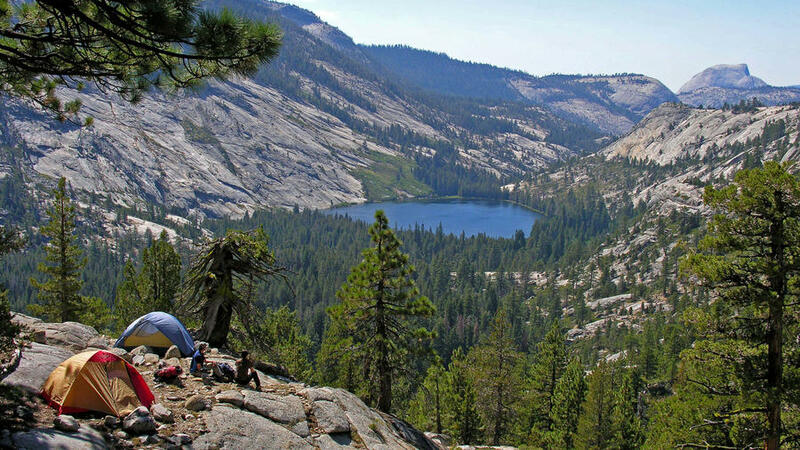 Or opt for a first-come, first-served campground such as Porcupine Flat, Tamarack Flat, White Wolf, or half of the sites in Tuolumne Meadows. Just get there early—sites can fill up by 8:30 a.m.
Porcupine Flat, White Wolf, Yosemite Creek, and three additional park campgrounds―Bridalveil Creek (Jul–early Sep), Camp 4 (year-round), and Tamarack Flat (Jun–early Sep)―are first come, first served. Reservations are a must at all others (reserve up to five months in advance on the 15th of each month; http://reservations.nps.gov or 800/436- 7275). INFO: Seven-day pass $20 per vehicle. or 209/ 372-0200.